Art Appreciation classes on Mondays, once a month, after school 3-4.30pm. The art produced during 2018 was exhibited at the School in June as part of Cruinniu na nóg events around Ireland & then in July went on show at Siar Gallery in Kinvara. By Miriam Roland, age 10. By Lochlan Hill, age 6. By Sarah Anne Sweeney, age 10. Hundreds of children from around the county took part in the Clare community games art competition in Ennis in February 2017. Our entrants did very well in the County finals. Lile (11) & Maud deEyto (7) with their entries for the Community Games. Lile came 2nd in U12 Model making. Euan Farrell, (age 10) with his entry into the 2017 Community Games. He came 2nd in the Boys U12 Art competition. Lisa Shields, (age11) with her entry, in the U12 girls which came 5th. Lisa herself is a very keen footballer! Artist Sarah Fuller will be teaching the senior classes the artistry of puppet making once again. This term they are taking their inspiration from a painting by Pieter Brueghel the Elder. The children make a range of amazing puppets and have used them to create shows with various themes. Last year the children experimented with light and shade and with the use of different strength light bulbs they created wonderful affects. The younger children have also made wonderful puppets with Sarah. An Art Appreciation & craft course is also offered to students for free after school from January/February. The course introduces some history of art and encourages the children to express what they have learned through different mediums and with their own interpretation influencing the final result. An exhibition of their work takes place in June. Pictures below show a Still life and a Self portrait class as part of the Art Appreciation class run once a month after school between the months of February and June. The children are introduced to elements of art history using a PowerPoint presentation and it is followed up by practical work – the aim is to learn and enjoy! Below: A small selection of 2017 Doodles which the children designed. The next drama production is Joseph and his amazing technicolor coat. It’s due to be performed before Christmas 2018 by the senior room classes. During Seachtain na Gaeilge (March 2018) the Junior room performed two short shows entirely in Irish. They then danced several sets of Irish dancing. 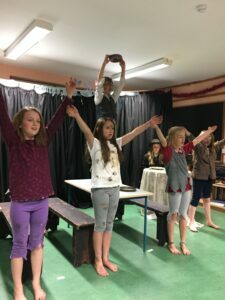 In December 2016, 3rd to 6th class students presented the musical ‘Oliver‘. Parents and the wider community were invited to the school to see an amazing performance. Well done to all the children and Muinteoir Carmel! In April 2016 the senior room presented the ‘Triumph of All Sorts’ written by Damian White. The play centred around characters of 1916 Ireland. Here are some pictures below. In March 2015 the seniors (3rd to 6th class) presented ‘Rats‘ aka ‘The Pied Piper of Hamelin‘ and performed on two nights for the local community. The children are given the opportunity to write some parts of the drama themselves. The Juniors present their show ‘Rannta agus Dánta‘ entirely through Irish during tSeachtain na Gaeilge. The School encourages creativity & learning in class and at home and several prizes have been won by New Quay School children. Book of Kells art competition 2018 -merit prize winner. Burren Beo poster prizes in both senio & junior rooms 2017. Toyota Ireland ‘Dream Car’ art competition – 3rd prize & entry sent to International competition in Japan. Doolin Coastguard art competition, 3 winners in different categories. Their entries are framed & displayed in the new station which opened in May 2015. 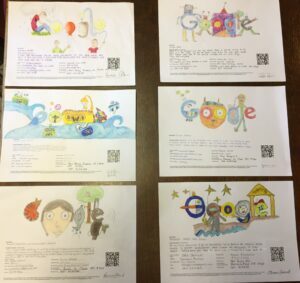 Doodle 4 Google, 2014- 2 finalists. Kinvara Credit Union Art Competitions: ‘Gotta Lotta Colour’ 2013 -three 1st prizes in round 1 & 1st prize in regional level; “Festival of Colour’ theme 2014 1st Prize round 1 & further prize in regional level. Kinvara Credit Union Schools Quiz 2014 -The Under 12’s team endured 10 rounds of questions and two tie breaker rounds before they were declared winners in Kinvara. There were 10 schools from the Kinvara area so this was a great achievement. The final took place in Galway in which the team came 5th out of 12 schools from Connaught. Munster Schools Edu8 -New Quay student won a school tour for the school!